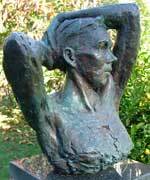 Dutch born artist and sculptor, Siene de Vries, lives and works in beautiful and remote Le Bons Bay on Banks Peninsula in the South Island of New Zealand. Siene de Vries studied at the Academie voor Beeldende Kunsten 'Academie Minerva', the school of fine arts in Groningen, the Netherlands, where he graduated in 1981. He exhibited in solo and group exhibitions in the Netherlands, Germany and Switzerland, and was involved in teaching and the organization of arts festivals before emigrating to New Zealand in 1988. Siene's work is in public and private collections in various countries around the world, and he exhibits in both New Zealand and the Netherlands. Siene and his wife, printmaker Saskia van Voorn, have lived on their small farm in Le Bons Bay for over twenty years. Each year in January, they open their studios to the public for a month long exhibition drawing an international audience.